If I break out in “UNDA DA SEA,” are you going to punch me? Look at those tentacles! I’ve never had tentacles on my plate before. I like tentacles on my plate. Don’t tell Ariel I said that. This dish is something ELSE, y’all. I know it might seem a smidge unapproachable, but a) you won’t rightly believe how little time it takes to pull together, and b) how inexpensive it is. And c) tentacles. OKAY, I must come out and admit something up front. When I requested this . . . animal, I said squid. Dude used the word squid and calamari interchangeably, but I know they’re not QUITE the same beast. 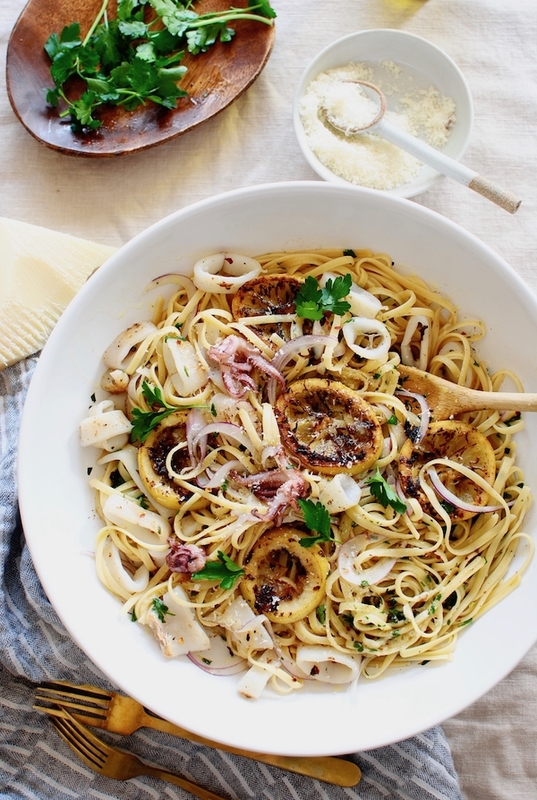 Calamari is much more expensive, and more tender. And smaller. But see, these are pretty tiny. Like a Snickers bar. But they weren’t pricey at ALL. Seriously, like $5 for six squidies. If they’re in fact squidies. I’m calling them squidies and not looking back. You’re like, “Why didn’t you just check the packaging, home slice?” Well, I did, but all it said was, “DON’T TELL URSULA.” So. Squid meets butter. The end. There’s also linguine, crushed red pepper, parsley, parmesan and lemon juice. LOTS of lemon juice. Oh! And red onion. So get this – instead of the traditional addition of briny capers, I swapped them out for thiiiiinly sliced (raw!) red onion. 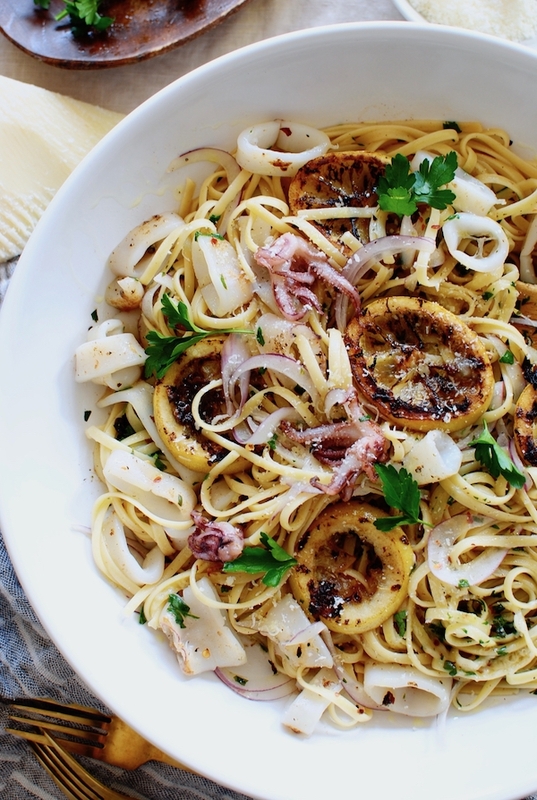 Partly because of color – the purple hues of the tentacles and the red onion hurt me so good. But also, flavorOMG. Can’t quite put my tentacle on it, but the marriage of seafood meets butter meets onion was like staaaaawp. I know you’re wrinkling your nose at the idea of raw onion. But listen, when they’re sliced this thin, they start to wilt a tad under the heat of the pasta, and while the flavor slightly mellows, you still get that tender barely-there crunch. It’s divine. Straight ridic. Also, the charred lemon is wack. A little flavor trippin’ technique I yoinked from my own Chicken Piccata recipe, it just sends this whole dish into serious overdrive. 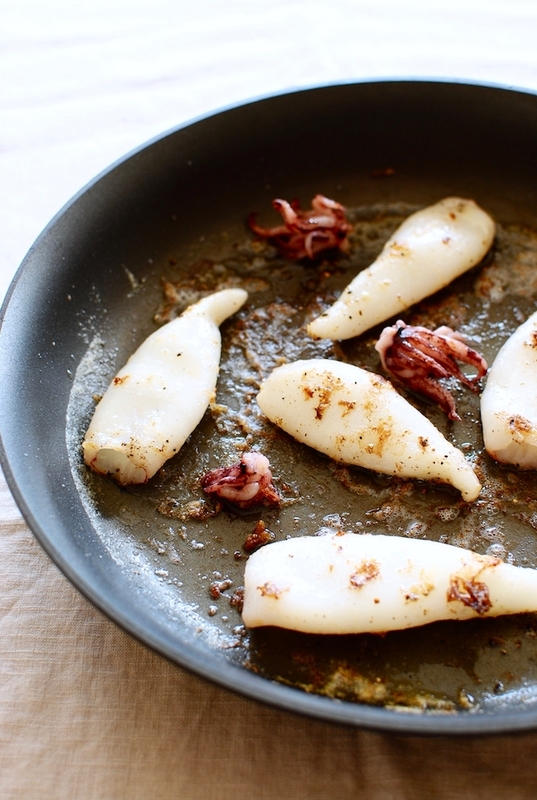 You’ll sear lemon wedges in the squid butter, then place them on the finished meal right at the end. UGH. The lemon peel is so blistered and tender, you can actually eat it, and it won’t make you want to slap someone. I dare you to try it. I can honestly say that picatta flavors are among my absolute favorite in the whole WORLD. (I’m including the sea, Ariel – chill.) You’ll never fail with butter, lemon and parsley. Never ever. The crushed red pepper and sliced onion add more DEPTH, you know. And you’re clearly aware of my obsession with depth. Like the sea. Sea depth. Melt 3 Tbs. of butter in a large skillet. 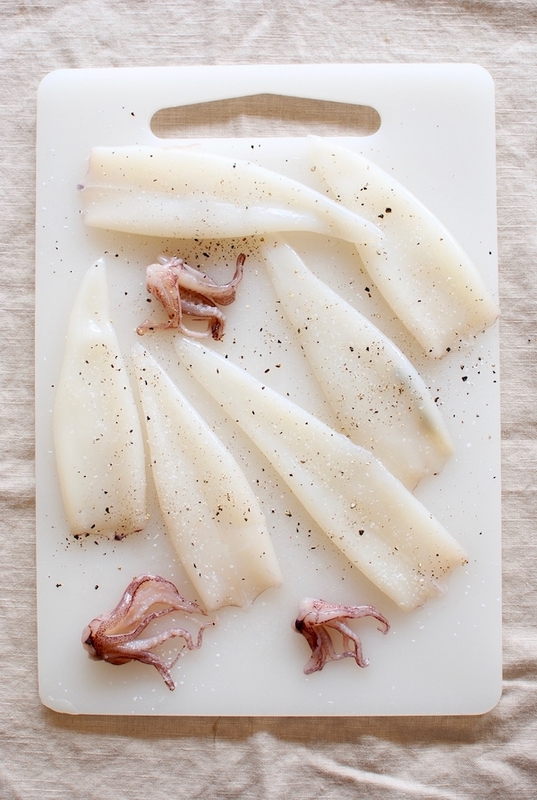 Season the squid on both sides with salt and pepper. Sear in the butter until slightly blistered on both sides, about six minutes total. Remove from the pan and slice into 1/2-inch rings. Back in the skillet, melt the remaining two Tbs. of butter. Once the foaming has subsided, add the sliced lemon and char on both sides. Set aside. To the pan, add the chicken stock, lemon juice from the other lemon, and parsley. Let simmer for a few minutes while the pasta cooks. In the meantime, bring a large pot of salted water to a boil. Cook the linguine until it reaches al dente. Using tongs, transfer the pasta right into the pan sauce. Reserve about a cup of pasta water. 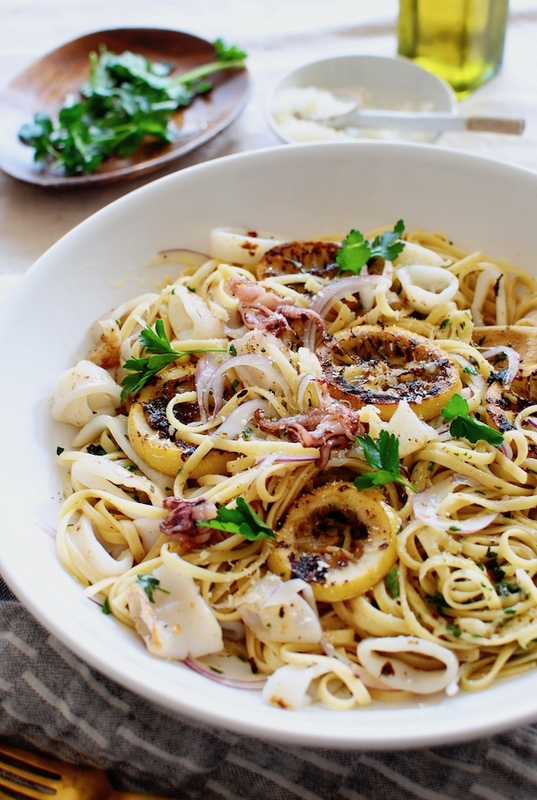 Off the heat, stir in the parmesan cheese, sliced squid and red onion. Slowly add the pasta water to create a thin sauce, as the pasta will start to soak up the existing pan sauce. 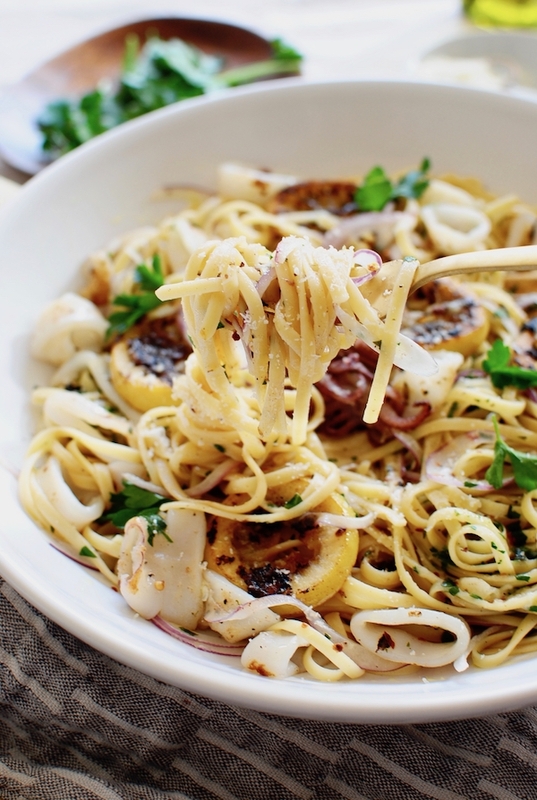 Garnish with the charred lemon slices, and extra parsley leaves. And more parmesan! And lemon. Always. 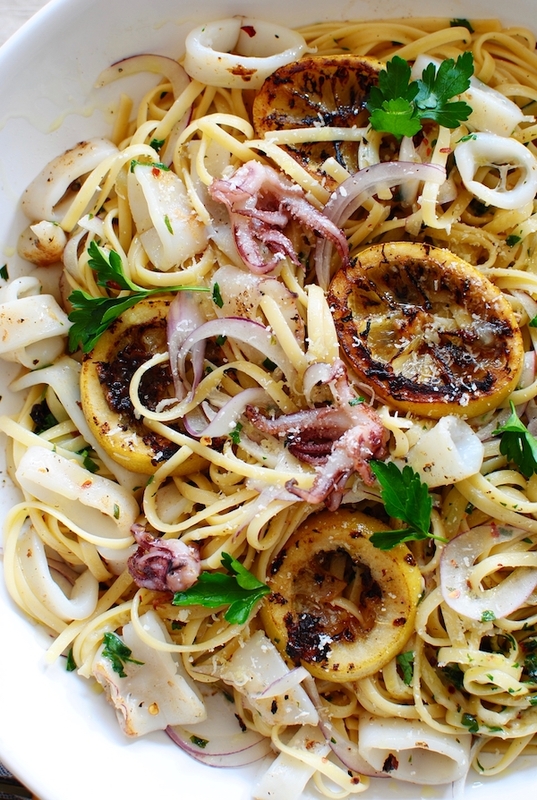 i have never cooked with squid or charred lemon in my life - need to change that. Ohhhhhhh super intrigued! Going to have to try this soon! Yum to the double YUM! I completely agree with you about picatta! I love making picatta with fish. 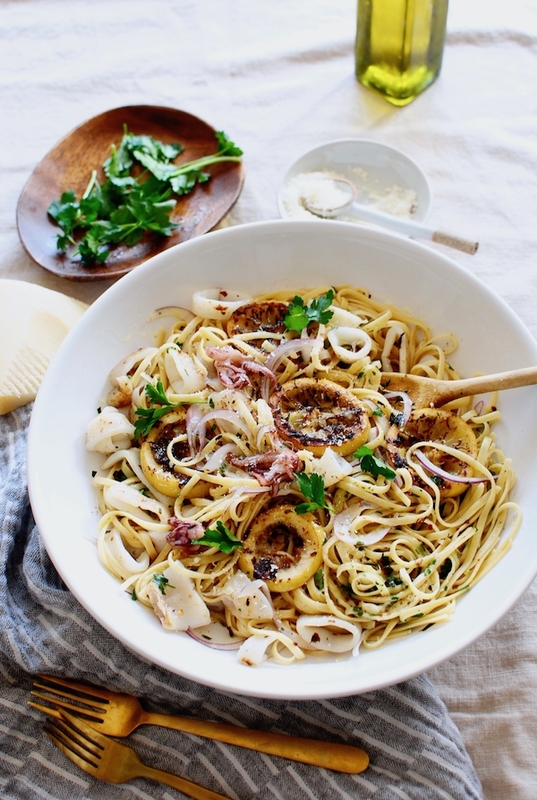 We love calamari but I have never made it before! I see it at my fish counter all the time but have never actually bought it. Adding it to the list (with mussels, another favorite but have never made!). 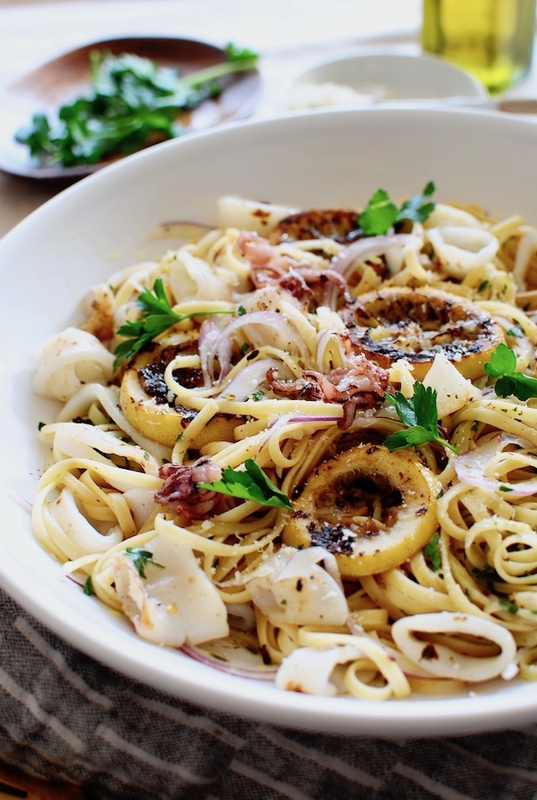 I don't know that anyone but you could convince me to cook squid! :) I can't wait to try this recipe. This is so refreshing ! I usually bake the squids in the oven with potatoes, white wine and rosemary but this is a completely new level to me. Thank you so much !